What is the History of Art Tripos? The History of Art Tripos consists of a one-year Part I and a Part II that may be studied in one or two years. While some undergraduates read History of Art for all three years, it is possible to take up the subject after studying for Part I of another Tripos. The length of the previous Part I affects whether the Part II in History of Art is completed in one or two years. The course offers a wide range of options. Part I combines the general development of studying the History of Art first-hand, often through objects in and around Cambridge, with courses on the Making and Meaning of Art & Architecture. In Part II, our Special Subjects range from the art, architecture and theory of Medieval and Renaissance Europe to the Modern period. The Tripos makes full use of the University’s resources: in order that students become familiar with Cambridge’s unique collections of art and its fine architecture, some of the teaching takes place in the Fitzwilliam Museum, Kettle’s Yard and the Colleges. To supplement the classes given by members of staff, there are stimulating guest lectures by well-known scholars. Throughout the course students are encouraged to develop their visual, analytical and literary skills. To get a sense of the kind of questions that Art Historians are interested in exploring, watch the video below to see Corpus supervision teacher Dr José Ramón Marcaida discuss how portrayals of the spectacular bird of paradise reflect the intersection between art and science . Why study History of Art at Corpus? The Department of History of Art, which is part of the University’s Faculty of Architecture and History of Art, is a five-minute walk away from Corpus Christi College. The University’s Fitzwilliam Museum, which houses a major collection of artworks from many periods and cultures, is also nearby, which is extremely convenient for Corpus undergraduates. 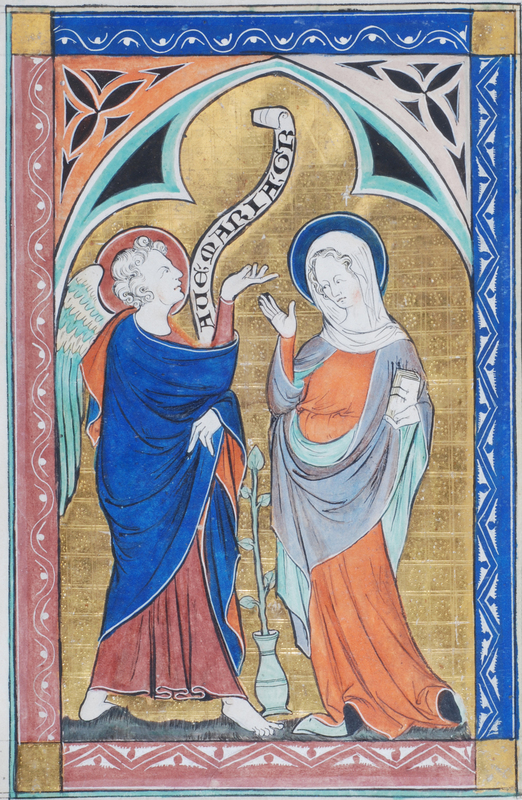 Another big attraction for art historians at Corpus is the famous Parker Library, home to ancient books and manuscripts such as the early fourteenth-century Peterborough Psalter, which contains the left-hand image. The College owns many such examples of illuminated manuscripts, which tell an important story in the development of art in medieval Britain. Our Director of Studies in History of Art is Dr Donal Cooper, whose main research interest is sacred art and architecture in Italy from the thirteenth to the sixteenth century. He is supported by our Praeceptor Dr José Ramón Marcaida who gives supervisions to Corpus students, and is involved in numerous research projects including “Genius Before Romanticism: Ingenuity in Early Modern Art and Science“. What do we look for in History of Art applicants? Prospective students need, above all, to demonstrate intellectual potential, visual sensitivity, and evidence of enthusiasm for the subject. The Director of Studies in History of Art has no special preference with regard to the A Levels taken by potential art historians; Modern Languages, Classics, History, History of Art and English are all useful subjects but not essential. The application procedure usually takes the form of asking all candidates who wish to read History of Art, about halfway through the autumn term, to submit two examples of recent work which they consider best represent their ability. Essays will not be considered if they appear to have been specially prepared for us – they must have been set for A Level classes in the usual way, and marked by the teacher. Candidates will be assessed on the basis of their application form, their references, their interview and their submitted work. The interview will take place in December. The College also welcomes applications from post-A level candidates. The same range of evidence will be used in assessing their application, as in the case of fourth-term candidates, although some additional breadth of knowledge and intellectual maturity will naturally be expected. Candidates who wish to read History of Art as their Part II, following Part I in another Tripos, should indicate their intention as soon as they apply to the College. They will then be given an interview by the Director of Studies in History of Art as well as by the Director of Studies in the proposed subject of their Part I. All prospective candidates are warmly encouraged to visit Corpus by attending one of our Open Days, as well as the Department. Further information for applicants is available on the Admissions page of the departmental website.